All seats are reserved. Table sponsorships are available. For availability, call 601-977-7871. Click here to read CEO Mike Petters’ Business Luncheon speech. 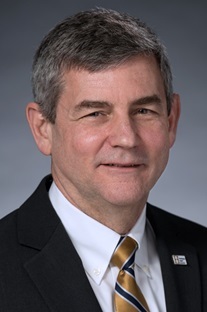 Mike Petters is president and CEO of Huntington Ingalls Industries, America’s largest military shipbuilding company and a provider of manufacturing, engineering and management services to the nuclear energy, oil and gas markets. He is also a member of HII’s Board of Directors. Petters previously served as president of Northrop Grumman Shipbuilding and as president of Northrop Grumman’s Newport News sector. He joined Newport News Shipbuilding in 1987 in the Los Angeles-class submarine construction division. He held a number of increasingly responsible positions throughout the organization, including production supervisor for submarines, marketing manager for submarines and carriers, vice president of aircraft carrier programs, vice president of contracts and pricing, and vice president of human resources. A native of Florida, Petters earned a bachelor’s degree in physics from the U.S. Naval Academy in 1982, served aboard the nuclear-powered submarine USS George Bancroft (SSBN 643) and spent five years in the U.S. Naval Reserve. In 1993, he earned an MBA from the College of William and Mary. Petters is a past chairman and current member of the Virginia Business Council, a member of the Aerospace Industries Association’s executive committee and a member of the Commonwealth of Virginia’s Advisory Council on Revenue Estimates. He serves on the board of directors for the U.S. Naval Academy Foundation and the National Association of Manufacturers. He also serves on the board of advisors for the Center for a New American Security, the board of trustees of the Naval Aviation Museum Foundation and the distinguished advisory board for the Dolphin Scholarship Foundation. In 2017, Petters received the Committee for Economic Development’s Owen B. Butler Education Excellence Award, which recognizes an individual’s exceptional commitment to quality education, skills development and workforce development programs.